Most of the year, the humble chocolate chip cookie wins my heart. 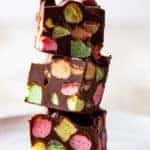 It’s delicious, easy to make, and contains chocolate. What more could you ask for? Then the calendar flips to December and I don’t care about chocolate chip cookies. I’m all about cut-out cookies and gingerbread boys. Being all about cut out and gingerbread cookies has lead to a bit of a problem. My, um, massive cookie cutter collection. Right now, the collection is over 100 cutters and growing. But you know what? Even though I hoard love those cutters, I tend to use my mom’s old copper cutters each Christmas. They’re the ones you see in the photos. And they are the cutters she used when she made holiday cookies. My mom used to bake dozens and dozens of cookies from the day after Thanksgiving right up to Christmas week. Her cut-out cookies were legendary. Everyone got a package. Her friend? Got a package of cookies. The mailman? Got cookies. The lady who worked at the grocery store who she said hello to each Tuesday? You guessed it. She got cookies. During December my mom’s car always smelled like cookies. It was the best. So when I set out to create a cut out cookie recipe for my new cookbook, it was my mom’s recipe that served as the inspiration. To make all those cookies, my mom’s recipe needed to be easy since she’d crank out several batches at a time. Her method went something like this: measure out the flour, salt, and baking powder. (These cookies were not gluten-free.) Cream together shortening (Yes, back in the day she used shortening. #NoJudgement) and sugar in a large bowl. Add an egg. Add the flour. Chill. Roll. Bake. Done. The question was: could grain-free cut out cookies be this easy? My mom had it easy. She baked with wheat flour. This meant she’d throw a bag of all-purpose flour into her cart at the grocery store, probably buying whatever was on sale, and not give it a second thought. Grain-free baking means we give the “flour” a lot of thought. For these cookies, I knew I wanted to use almond flour. Made from finely ground blanched almonds, almond flour bakes up surprisingly like wheat flour, especially in recipes like cookies or brownies. The thing about almond flour is that it tastes like almonds. This isn’t a bad thing. It just is what it is. The other thing about almond flour is that, since it’s made from ground almonds, it doesn’t have the soft mouthfeel that grain-based flours bring to recipes. When I tried cut-out cookies made with 100% almond flour, I liked them. They just didn’t taste like cut-out cookies. They were missing the sandy crumb that all good cut-out cookies have. When you combine an equal amount of tapioca starch with finely ground almond flour, you end up with a dough that’s a dream to work with. 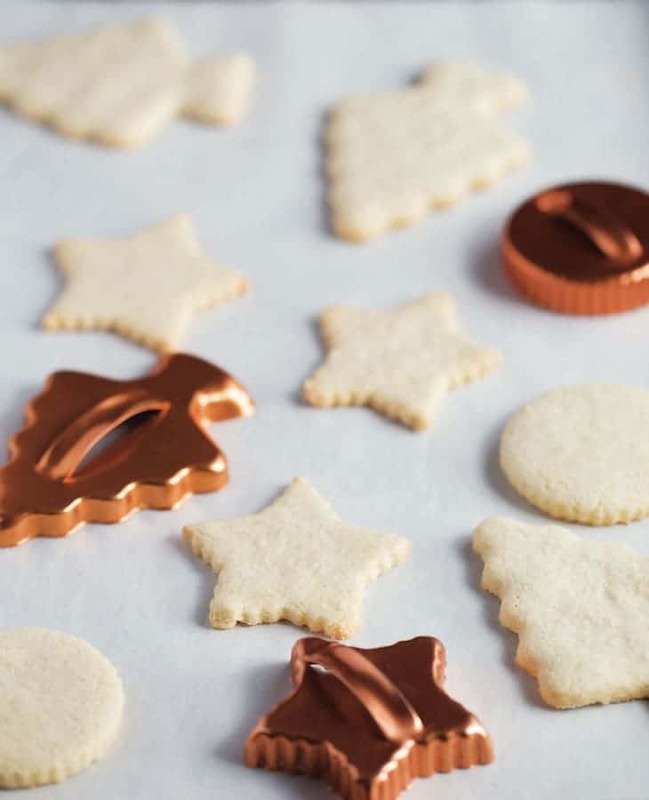 It rolls out without breaking, holds the shape you cut with the cookie cutter without spreading into a huge blob during baking, and, the very best part, it tastes like a traditional cut-out cookie. Somehow this cookie tastes buttery without containing a drop of dairy! But the flour and starch can’t do everything on it’s own. It needs some help from our friend sugar. To our bodies, sugar is sugar. All those claims about some sugars containing extra nutrients are, to me, a little misleading. Sure there are trace nutrients in unrefined sugar, that’s true. However, you’d have to eat so much of those sugars to get any nutritional benefit that you’d make yourself sick, which kind of defeats the purpose. While our bodies think sugar is sugar, our baking does not. There are two types of sugar in the baking world: dry sugar and liquid sugar. For cookies, dry sugar works best. It doesn’t bring any additional liquid to the dough. And that’s what we want. 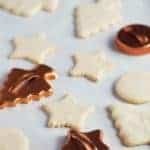 Cut out cookies don’t benefit from extra moisture. IN fact, when a cookie dough is too wet, it spreads during baking. That right there is what a broken dream looks like. Now that dough might have been too warm, contained too much fat, or used too much liquid sugar. I don’t know because I didn’t make the cookie. 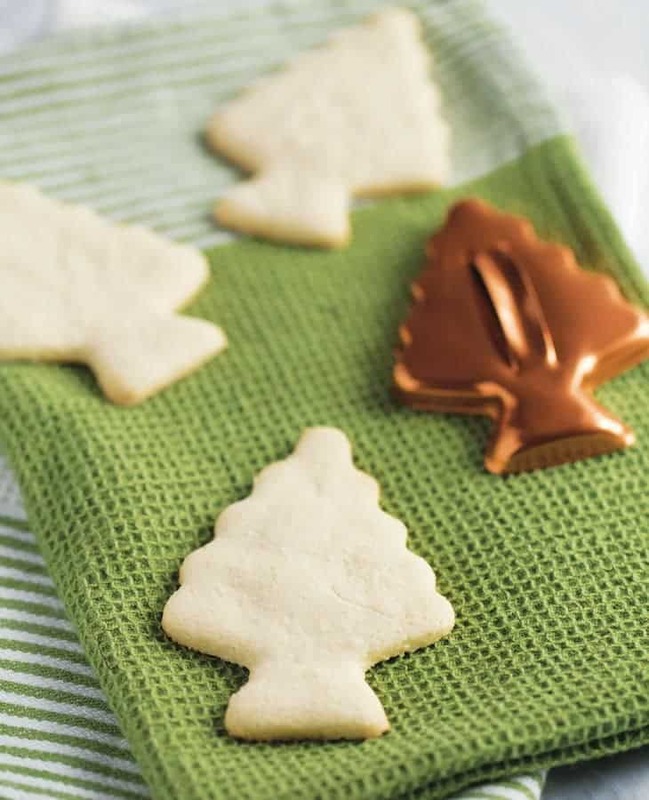 But since the water content of honey and maple sugar vary from batch to batch, it’s best to avoid using them for cut-out cookies. Ah, a cookie that holds its shape. That’s what we want! 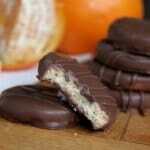 Paleo Cut Out Cookies: The Other Ingredients. Now that we’ve talked about the two most important ingredients, the flour and sugar, let’s take a quick look at the rest of the ingredients. One egg helps to hold everything together. It also adds flavor and a subtle richness. I haven’t tested this recipe egg-free. If I do, I’ll let you know how it goes! Since almond flour brings so much fat with it, we only need 1/4 cup of coconut oil or butter. If you are using coconut oil, make sure it’s soft but not melted. Unlike butter or vegetable shortening, coconut oil turns REALLY brittle when cold. It’s hard to cream brittle fat! Here’s what I do: if the coconut oil is cold and hard, I warm it gently in the microwave for about 10-15 seconds. Any more than that and the oil melts. We don’t want that! You want the oil soft but not melted. When you cream it together with the sugar, you don’t want any large lumps of coconut oil to remain. If you see any large lumps of coconut oil, reach into the bowl and break them up either with your fingers or a fork. If your diet includes dairy, use butter in place of the coconut oil. I like to use grass-fed unsalted butter. But any butter will do! Be sure it’s at room temperature before using. Without gluten to hold things together, the dough needs a little nudge to come together and play nice. Water does the trick! One tablespoon of room temperature water helps bind the ingredients into a dough without causing it to spread. Vanilla adds flavor. I think it partners so nicely with the almond flavor. 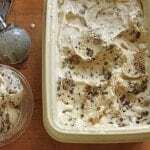 If you don’t like flavor of vanilla (gasp! ), go ahead and omit it. Too much baking powder causes cut out cookies to puff and lose their shape. Too little and you get hard cookies. For these cookies, the “just right” amount is 1/2 teaspoon. Most commercial baking powder contains corn starch. However, it’s easy to make your own! Here’s my recipe. A little salt helps to enhance the flavor of the cookies. Use recommend table or fine sea salt. Kosher or coarse salt tends to be too coarse for baking. The dough should just be at room temperature before rolling. If the dough cracks as you roll, that means it’s too cold. If it sticks to the counter, it’s too warm. Whisk the almond flour, tapioca starch, baking powder, and salt together in a small mixing bowl. Combine the evaporated cane juice and coconut oil in a medium mixing bowl. Use a handheld mixer set on medium speed to beat them until a thick paste forms. If there are any large lumps of coconut oil, stop the mixer and squeeze the paste together with your hand, or break up the lumps with a fork. Add the egg and mix until combined. Stop the mixer and add the dry ingredients, vanilla, and water. Mix until a dough forms. Turn the dough out onto the counter. Knead gently a few times. Wrap the dough in plastic wrap and chill for 1 hour. Adjust an oven rack to the middle position and preheat the oven to 325F. Line a rimmed baking sheet with parchment paper. Allow the dough to sit outside the refrigerator for about 10 minutes. Cut the dough in half and sprinkle your counter with a little tapioca starch. Roll out the dough about 1/4-inch thick. Cut into shapes and place on prepared baking sheet about 2 inches apart. Bake until set and golden brown, about 10 minutes for 4-inch cookies. Allow the cookies to cool on the pan on a wire rack for 5 minutes, then transfer the cookies directly to the rack to cool completely. Allow the baking sheet to cool. Reroll scraps and repeat with the remaining dough.